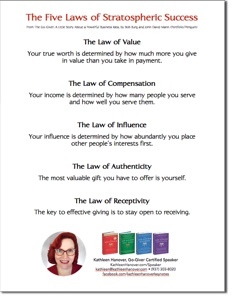 Download your free “5 Laws of Stratospheric Success” Mini-Poster! Simply click on the image to open the PDF in a new browser tab. Then right-click and “save as” to your hard drive. No opt-in required. Get more marketing and public relations tips that can help you succeed “The Go-Giver Way™”. Check your inbox for your confirmation email!